Success is Achieve by Refusing to Quit! In the 16th century, the Spanish Conquistador Cortes’ burned his boats upon arriving in Mexico to conquer the Aztecs, making retreat not an option. This mentality led the Spanish warriors to fight harder and without doubt, for they knew the only way to see their loved ones again was through victory! As a serial entrepreneur I know this is much easier said than done. For when I am in the think of starting or growing a business, I rarely have the time to reflect on whether or not to quit. So I have found that by fully committing to achieve success at the point when I believe I have a viable business opportunity that I am able to be more focused. Plus by removing all doubt from my mind, when I get a “No” or negative push back I tend to focus on the “why” and “what next” instead of consistently deciding “if” to move forward. Ironically this innate ability for entrepreneurs to fully commit themselves is why many of the most successful entrepreneurs come off as a$$holes, if not crazy. This happens because the entrepreneurs have convinced themselves that they are chasing down a viable business opportunity, are fully committed to never quit, and will find a way to achieve success. Embracing the never quit” or “burn the boats” mindset does not come naturally to most, but success can be obtained by all who follow these 5 steps: 1) Define the Goal, 2) Identify the Unknowns, 3) Identify the Payoff, 4) Understand the Commitment, and 5) Commit (or don’t). Defining the goal is as much focused on what is to be achieved as it is about when is the goal completed. For the Spanish it was conquest of the Aztecs riches. More specifically the Spanish didn’t burn the boats and then attack every Empire in South and North America…as that would be suicidal and stupid. Rather they burned the boats solely to commit to conquering the Aztecs. For me, I tend to build rather than destroy, so I commit to building a sustainable business. Essentially committing to never quit until the business had stable revenues and could operate on its own. Then I would evaluate the best path forward (selling the business, licensing it, or growing it) and recommit to never quit. What is your defined goal? Understanding and identifying the goal’s unknowns eleviates surprises and minimizes the chance for doubt. For my businesses these spanned the gambit, but in one instance I recognized that I did not know how long it took to make a sale nor did I know the exact decision maker in companies. By identifying these unknowns, I could make my commitment knowing that I would be getting “schooled” by the market early on and was prepared for some rocky learning experiences. The Spanish didn’t know what environment they would find when they landed in Mexico. They knew their meager force of roughly 500 men was substantially outnumbered by the Aztec empire. So they realized that to overcome the unknowns they had to be completely committed, and vowed to return to Spain in the Aztecs boats. Identifying what the benefit will be for not quitting is incredibly important, as during the trying times keeping focused on the payoff will provide a continual drive. For my businesses this has always been to help the customer and to make money. Often when the selling get difficult or software breaks, keeping focused as to why I put myself in this awful, awful position can reinvigorate myself to push on. For me I even write these down and put them in a place that I can see every day. For the Spanish and Cortes’ this was to capture the Aztec’s treasures, which were considered to be the greatest cache in the world. This was what the spanish were willing to fight and face death for. What payoff is worth your commitment? 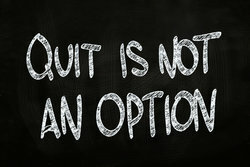 Understand what refusing to quit means and the impact it could have on your life, both positively and negatively. For me this is focused on how much time/money might I be required to invest and how will that impact my personal and family life. (Inevitably people think about how much money the could lose if they refuse to quit and end up failing, though remember you are refusing to quit on a goal you see as viable…not just any goal.) For the Spanish this meant that there were no reinforcements and that victory required capturing the Aztecs boats in the harbor to be able to return home. What are the implications of your commitment? Finally review the first four steps and then decide if you can make the commitment not to quit. For me this is not an easy decision and usually takes about a month or two before I will make this commitment. Though when I do, I refuse, refuse to quit. On my first few companies my advisors called me crazy and obsessed, until I found a way to succeed. Then they called me smart and determined. So recognize that most people won’t understand this commitment until you achieve your final payoff. For the Cortez and his Spanish soldiers/sailors the moment they landed, the had to make the decision to burn the boats. Even though they didn’t know how big the Aztec’s fighting force was, they made the commitment anyways! Got the necessary insights and guts to commit? Likely when you first started reading this post, Cortes’ and the Spanish strategy of “burning their transportation” or me refusing to quit on a business likely sounded fairly ill-advised or even stupid. Though now after understanding the more involved process for coming to this commitment, it may seem more reasonable and even strategic. For me, absolutely refusing, refusing to quit has been my winning strategy and that can be the same for other entrepreneurs just like you! What’s Your Results been when Refusing to Quit?